It’s most tasty and healthy fruits. Guavas are common tropical fruits cultivated and enjoyed in many tropical and subtropical regions. 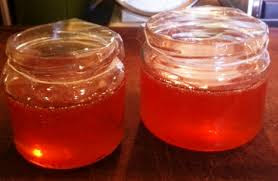 Guava Jelly makes to needed some steps. 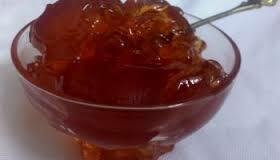 Wash and cut guava into thin and cube slices and cook with water until very soft. Now place in a large saucepan and cover with just enough water to cover the fruit well. Then cover and cook till guavas are very tender, about an hour. Cover an expanded bowl with a cotton cloth and invert fruit onto the cloth taking care to catch the liquid that drips through the cotton, into the bowl. Gather the four ends of the cloth and tie a knot and hang this’ bag' for about five hours and collect all the drippings into the bowl. Carefully squeeze out any juice left in the cloth. For every cup of liquid add one cup of sugar and one tablespoon of lemon juice. If there are five cups of liquid you would need to add five cups of sugar and four tablespoons of citric acid/lemon juice. Put this mixture back on fire and bring to a boil. And now lower heat and cook, stirring constantly (as the liquid tends to boil over), till the liquid starts coating the spoon thickly and the juice/jelly drips from the spoon in jointed drops. Let stand for an hour and pour into jars while still warm.